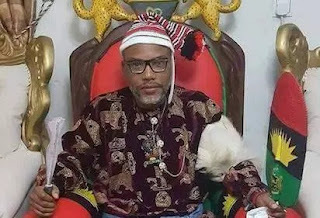 The leader of the Indigenous People of Biafra (IPOB),Nnamdi Kanu has said he will challenge the court order directing his arrest in the United Kingdom. Kanu made the disclosure while reacting to the revoking of the bail granted to him in 2017, after his continued absence in court, insisting he is innocent of the accusations against him. Binta Nyako justice of the court, also issued an arrest warrant against the IPOB leader, citing the continued absence of the IPOB leader in court. He then moved to the UK. Speaking during a broadcast on Radio Biafra, a recording of which was obtained by TheCable on Saturday, Kanu said he has instructed his lawyers to challenge the arrest warrant in a UK court. “Every move they make, every decision they take, I will challenge. I have instructed my lawyers, we will challenge in a competent court of law here in Britain where the law actually works. I am waiting for them. “They have not even defined the crime they said I have committed. There is no crime in Nigeria called secession; secession is not a crime in Nigeria or anywhere in the world. Only armed rebellion is a crime, not self-determination,” said Kanu. “If you are out to demoralise us, you will never ever succeed. We will continue to agitate; we continue to move forward because we are IPOB; we don’t relent and can never ever relent.